Fisker is again recalling the Fisker Karma hyrbid-electric luxury vehicle after the most recent fire was linked to a faulty cooling fan. There are approximately 1,000 of these EVs on the road and two fires so far this summer. The most recent fire occurred when an owner parked his car at a Woodside, California grocery store. By the time he was done getting the groceries his car was already on fire. 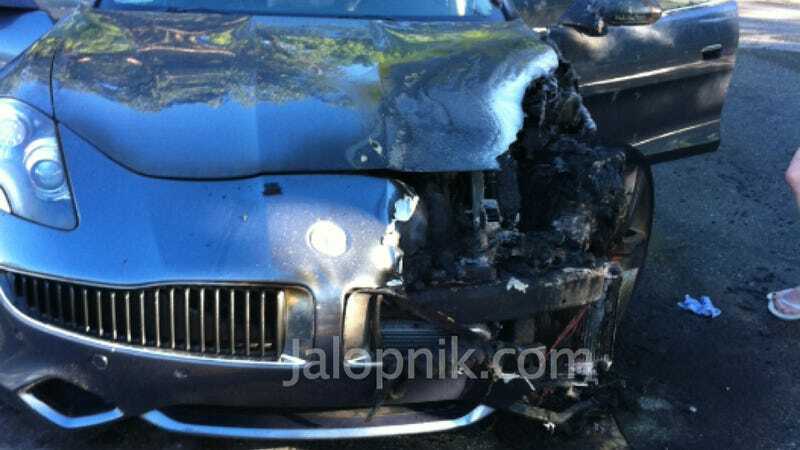 This was the second incident for government-financed Fisker. Earlier this summer a brand new Fisker was blamed for a house fire. This is also the second recall from Fisker over a possible fire risk following the recall of approximately 240 vehicles due to an improperly-positioned hose clamp. Fisker sent an investigator to check out the car and determined a coolant fan near the front wheel well of the car was the cause.